Beanie Buddies are the larger version of Ty beanie babies. If you like the soft squidgy feel of the beanie babies bears then you will definitely love a beanie buddy. Double the size but just as cuddly and soft as their smaller relatives. These larger Ty beanies are collectible in their own right and many have also been made as limited editions and for special occasions. Making them particularly collectible. Of course children also love them. They are easy to wash and are extremely robust too and so can be played with without fear of damage to the bear (of child). This page includes my own Ty bear buddies for sale as well as the current listings for them on EBay both in the Uk and the USA. Happy Shopping and I hope you find the teddy bear you are looking for. Condition: Like New, never been played with. He is extremely soft. Description: Peace bears came in a variety of different colours and each one is unique due to the nature of the type of colour mixing. This bear comes from the Neon range with the colours being lovely and bright. 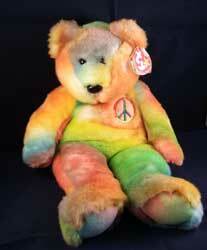 Peace bears are very collectible due the fact that each one is slightly different from another. In fact there are even some collectors of peace bears only. He comes with both his original ear tag and tush tag.